Hazardous waste sites are not exactly an endangered species: In Buncombe County, North Carolina alone, there are about 30 of them, relics of former manufacturing operations or other businesses that left behind toxic residues. Some of those companies were established before the 1970s, when pioneering environmental laws began regulating industrial pollution. Others simply ignored the laws governing disposal of dangerous chemicals. Either way, these contaminants are hard to get rid of. Expensive cleanup efforts can drag on for decades with no sure resolution. 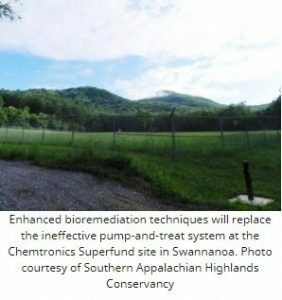 The Chemtronics site in Swannanoa, North Carolina for example, has been on the U.S. Environmental Protection Agency’s National Priorities List since 1982, yet there’s still no end in sight to the cleanup (see “Chemtronics: From Chemical Weapons to Conservation Easement,” March 24, 2016, Mountain Xpress). anwhile, over at the CTS site on Mills Gap Road in South Asheville, North Carolina concerns about the pace and effectiveness of cleanup efforts have mobilized community activists (see “Toxic Legacy: CTS Site Breeds Heartache for Residents,” June 1, 2016, Mountain Xpress). But a group of innovative strategies collectively known as “in situ remediation” could dramatically improve the prospects for restoring these and other high-profile Superfund sites more quickly and at lower cost. Instead of trying to mechanically remove contaminants from a property, in situ remediation harnesses the ability of certain chemicals or bacteria to tackle them where they are and turn them into harmless substances. Later this year, environmental contractors will implement such strategies at both those sites, under the auspices of U.S. EPA Region 4 officials. And meanwhile, another local North Carolina project that’s already underway — RiverLink’s phytoremediation effort at the former Edaco junkyard on Amboy Road — gives some hints of these approaches’ potential to reclaim festering hazardous waste sites. 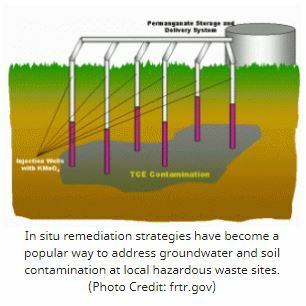 In situ remediation utilizes emerging technologies to insert various natural or mechanical elements into groundwater or contaminated soil. The specific strategy employed depends on both the particular pollutants involved and the physical characteristics of the site. At Chemtronics, plans call for bioremediation: using bacteria that actually consume harmful contaminants. Nutrients and oxygen will also be injected to help the bacteria do their job. At the CTS site, meanwhile, a concoction of chemical oxidizers, which attack and break down the contaminants’ molecular structure, will be injected into the ground. And at RiverLink’s Karen Cragnolin Park, native grasses infused with bacteria that “eat” the pollutants were planted at 26 places on the property in 2013. Two key factors have helped such strategies gain traction: the emergence of newer technologies over the last two decades, and increased understanding of the limits of traditional cleanup methods. The long-running cleanup efforts at Chemtronics seem to bear out that assessment. A series of samples and tests conducted by Altamont Environmental over a three-year period found that the pump-and-treat system that’s been in operation since the early 1990s has been only 23 percent effective in removing contamination, according to U.S. EPA site supervisor Jon Bornholm. After several years of on-site pilot studies at Chemtronics, officials settled on in situ bioremediation as the most promising alternative strategy. Altamont, says Bornholm, “was able to show that it was removing at least 51 percent” of the contaminants. To read the remainder of this article, visit the Mountain Xpress website.